The historic California drought is preventing rice farmers from flooding their fields -- and reducing the roosting grounds of Sandhill cranes. 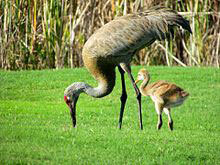 Sandhill cranes are majestic gray birds with crimson crowns and wing spans of up to six feet. Each winter, many gather in the fields of California’s Central Valley. There, rice farmers flood their fields to break down the post-harvest stubble, and the cranes use the fields to roost. That’s Dawit Zeleke of The Nature Conservancy. His group operates a 9,000-acre ranch in the valley. Zeleke says farmers grew less rice last season because of the drought, forcing the cranes into a smaller number of fields. Scientists expect droughts to become more common as the climate warms. So farmers and conservationists will have to work together to meet the needs of agriculture and preserve critical habitat for these remarkable birds. Reporting credit: ChavoBart Digital Media. Photo source: Sandhill cranes (Wikipedia).